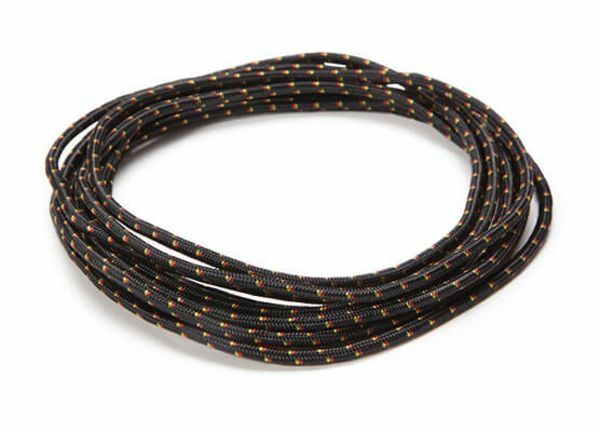 Tech Cord is an exceptionally strong cord made of a 100 % Technora® core surrounded by a polyester sheath. This small diameter high strength rope is very abrasion resistant and is perfect as a cordelette rope, for balancing anchors, slinging chocks and hexes or as an emergency rappel line. TEUFELBERGER’s Tech Cord is an exceptionally strong and very abrasion resistant cord that is perfect for pre-tied cordelettes. The tightly woven polyester sheath surrounds a parallel fiber core made up of 100 % Technora®, resulting in a cord that has extremely high tensile strength (3,000 pound tensile for 3mm; 4,700 pound tensile for 5mm). Tech Cord is a perfect anchor rope for balancing anchors or top rope anchors as well as slinging chocks and hexes. In addition, Tech cord is also used as a zip line brake. This cord was originally designed in conjunction with the US Military as an emergency rappel and bailout cord. It is still used in those applications today. The reported tensile strength of Tech Cord, as with any rope, can be significantly reduced when used with a knot. This is especially applicable to Technora® The most recommended knot for this cord is a double fisherman’s. Tech cord is available in 2 diameters and in 4 colors (3mm available in black only). Exceptionally strong for it’s size, seriously!